The LaPaz Lions Club is hard at work on a project that was near and dear to two former Marshall County Historical Society board members’ hearts. Elizabeth Marshall and Kathryn Weissert, who have both passed away, had focused for some time on erecting signs at the county’s unmarked cemeteries. Lions secretary and treasurer Don Balka said that for those looking for genealogy information, unmarked cemeteries can pose a real problem. The Marshall County Neighborhood Center provides basic needs through their community food pantry and clothing pantry. During the holidays they distribute Thanksgiving Baskets and Christmas Gifts throughout Marshall County. They also provide household and utility assistance. Bill Shemberger is best remembered for racing the back roads of northern Indiana peddling band instruments. Though born into an Elkhart family of modest means, his parents insisted their children have a music education. Bill played the trombone; his sister, Hazel, played the piano. 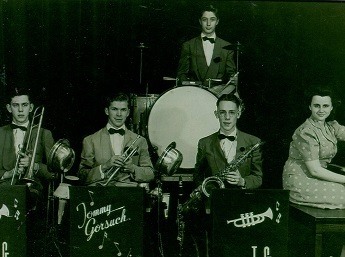 Their father worked for the railroad so Bill traveled free to Chicago for trombone lessons. By the time he was in high school, Bill was playing in dance bands all over northern Indiana. When his father’s health failed and Bill became his parents’ sole support, he attended school by day, worked nights in a bakery and played with bands on weekends.